Now that you’ve had a thorough eye examination and careful refraction to obtain a precise prescription, the next step is selecting the best combination of lens design, material and treatments for your visual needs to maximize your vision and comfort. Please take the time to educate yourself about the advancements of the new ophthalmic lens materials and treatments. 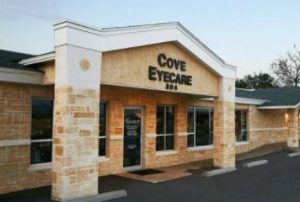 Our doctors and optical technicians at Cove Eyecare stay current in all the advancements so they can suggest the best options for your needs. Try using our interactive eyeglass guide, brought to you by Transitions Optical, for printable recommendations you can take to your next appointment. Additionally, we have handy in office ‘Lens Selection Guides’ for your use. The single most important addition to your eyewear is an Anti-Glare Lens Treatment. First developed to improve the performance of telescopes, microscopes and camera lenses, Anti-Glare treatments vastly improve the quality of your vision by reducing unwanted reflections from the lens surfaces. Anti-Glare Treatments make your lenses appear almost invisible, reduce eye fatigue from glare and reduce haloes around lights. Anti-Glare also allows more light through the lens and improves the quality of your night vision. Anti-Glare treatments help your lenses appear almost invisible which improving your appearance as others are able to see your eyes instead of annoying reflections on the surface of your lenses. Don’t be without it, even if you’ve been dissatisfied with big – chain anti glare products in the past. Anti – Glare lens technology continues to advance with improvements in lens materials. This has resulted in anti-glare lens treatments that are substrate matched to the lens, creating a molecular “Lock and key” adherence between the lens material and the anti-glare treatment. This provides unparalleled durability and performance, with the premium products offering advanced visual performance with superior anti-scratch, anti-static and anti-glare properties. This helps to virtually eliminate annoying reflections which can cause eyestrain, resistance to fingerprints, smudges, and dirt. You can be assured of a guarantee against cracking, crazing, peeling and scratching for the ultimate in enhanced visual clarity. Also, Several studies as well as data from OSHA and ISO, all show there are hazards associated with the High Energy Visible (HEV) Blue Light portion of the light spectrum. Blue light, including HEV Blue Light, is emitted from hand-held devices such as smart phones and tablets. Symptoms as diverse as sleep disorders in children and adolescents, headaches, blurred vision, and fatigue can be due to exposure to blue light radiating from hand-held digital equipment. Within the visible light spectrum there is “good blue light” and “bad blue blight.” The good blue light helps our body’s biorhythms and sleep patterns. While overexposure to the HEV, or “bad blue light,” attacks us with a wide range of annoying and chronic conditions associated with Computer Vision Syndrome (CVS) and Digital Eye Strain (DES). 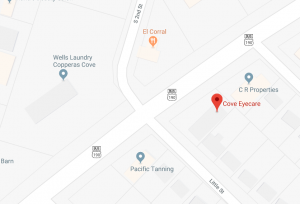 Cove Eyecare offers a solution to this problem through a treatment called Recharge EX3TM, an anti-reflective lens treatment that reflects the harmful Blue Light away from the eyes. Ask about it today. Developed during the space race in the 1960s and introduced to the ophthalmic lens market in the late 1970s, polycarbonate has been available as a thinner and lighter choice in lens material for over 30 years. Still widely used by retail and budget chains because it is extremely inexpensive, polycarbonate causes much disappointment when “bargain” eyewear is unusable due to scratches long before they’re due for replacement. Major drawbacks to this lens material in addition to scratching is its lack of optical quality and clarity. With an Abbe value of 29, polycarbonate’s chromatic aberration is the highest of any lens material in use today. Furthermore, it is a very poor choice in drill mount frames because of its lack of tensile strength and certainty of edge cracking and cracking around drill holes. But by far, the biggest complaint about Polycarbonate lenses besides the distortion in vision is the propensity for scratching, even when cared for very carefully. Introduced in 2001 by PPG, Trivex is the only lens material other than polycarbonate to pass FDA Impact Resistance Test, the High Velocity Impact Test, and meet ANSI Z87.1 ’89 standards. Trivex has rapidly increased in both popularity and availability in a multitude of lens types. Like polycarbonate, Trivex also has inherent 100% UVA and UVB protection. However, unlike polycarbonate, Trivex has an Abbe value of 45, making it optically superior by far and a perfect match for the optics of the human eye. It is also the first plastic lens that matches both the optical quality and abrasive resistance of glass, with the added distinction of being the lightest weight of any lens material available today. Further distinguishig itself, Trivex is ideal for drill mounting because the tensile strength of Trivex makes it highly resistant to cracking around drill holes. With a lifetime guarantee against stress fractures and drill mount cracking, two year guarantee against scratches, thin profile and light weight, Trivex is the best choice and number one recommendation in lens material for the majority of individuals. If you require a stronger prescription, advances in lens materials and designs can make your eyewear far better than ever before. There are several High Index materials and aspheric lens designs that are ideal for those individuals with higher power prescriptions needs. Proper choice of the combination of material and design will help to minimize the thickness and weight of your lenses, help eliminate unwanted magnification and reduce distortion of the appearance of your eyes and face as seen by others. Our technicians will offer expert advice for the best high index material and design for your particular prescription needs to help maximize your vision and your appearance. For those who want the convenience of a “2 in 1” lens. These lenses turn dark outside with exposure to light to provide sun protection and change back to clear once inside! Bifocals allow the wearer to read through one area of the lens, and to focus on distant objects through another area of the lens. As the eyes age, though, a stronger prescription is needed to read. This would be fine, but the stronger prescription that allows for reading makes it difficult to focus on objects at intermediate distances, thus, trifocals are necessary for a third prescription for intermediate focusing. For people who need a bifocal but do not want a visible line. These lenses give you a range of prescriptions to smooth your transition from distance to near. The biggest functional benefit of progressives is the ability to have distance, intermediate (computer), and near vision all in one pair of glasses. Used to decrease surface glare from the sun, water and driving to create clearer vision for joggers, skiers, golfers, bikers and even people who may be sensitive to the sun or for post cataract patients. If you have hard resin lenses, you should consider getting a scratch resistant coating. Resins and plastics are more susceptible to scratches than glass. Scratches damage the cosmetic look of the lenses as well as their performance. With a scratch resistant coating, you don’t have to worry so much about minor scratches on your lenses. Get tips on caring for your Prescription Eyeglasses and learn about the benefits of bifocals, progressives, high index lenses and prescription sunglasses.